One of the ironies of being in the film business is that when you finally get the chance to make your dream project, it often ends up being your worst film. In 1985 John Carpenter was on a roll, enjoying both the commercial success of Christine and the Oscar buzz for Starman. Having long dreamed of making a martial arts movie, he leapt at the chance to direct Big Trouble in Little China - a decision which ended his relationship with Hollywood, and ultimately resulted in one of his weakest films. As with Prince of Darkness, Carpenter's subsequent failure, there is something inherently interesting in the central concept of this film. It aims to do for martial arts movies what Indiana Jones did for matinee idols: take all the clichés and conventions of those films, restage them with the budgets they deserved, and pay tribute to the aspects that worked while sending up those that didn't. The twist with Big Trouble is that this story does not have a period setting, with Carpenter attempting to marry ancient Chinese mythology to the technology and social attitudes of the 1980s. Carpenter may not have Steven Spielberg's track record when it comes to blockbusters, but he had shown his knack for directing action movies on Assault on Precinct 13 and, to a lesser extent, Escape from New York. And to give credit where it's due, the design elements of Big Trouble are pretty good. Dean Cundey, Carpenter's long-time cinematographer, gives the film a grainy B-movie look while utilising anamorphic lenses (another Carpenter trademark) to make the action feel very modern. The stunt choreography by James Lew is balletic but playful, creating stunts which are cartoonish without prompting us to look where all the wires or trampolines are hidden. Unfortunately all the good work of Carpenter and his colleagues comes to nothing. After a pretty decent opening, Big Trouble in Little China slowly descends into the very formulas it was trying to send up, resulting in a film which is repetitive, uninvolving and lacking in narrative direction. The central problem lies in a further comparison to Indiana Jones, namely in the business of being tongue-in-cheek. Although Raiders of the Lost Ark was clearly motivated by a desire to send up its subject matter, Spielberg understood that it wasn't enough to simply stand around making fun of old film clichés. In order to sell the film to an audience, it had to be entertaining in its own right, with enough in the way of pace and punchy action to wow an audience who hadn't grown up on John Ford or Howard Hawks. One of the great successes of Raiders - in fact, of all the original trilogy - was its combination of pace and narrative; the story was pulpy enough to be gripping when married to the action, but even if you weren't that interested in what was going on, you could just sit back and enjoy the spectacle in blissful ignorance. 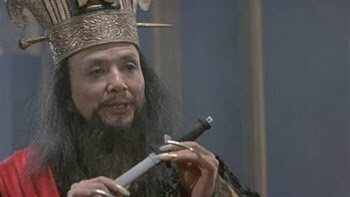 Big Trouble in Little China doesn't have this perfect pacing: it barrels along so quickly that the story keeps getting lost, with characters having to stop and explain the plot to each other in an increasingly incoherent manner. Because the film keeps losing its narrative thread (what there is of it), its ability to work as an affectionate pastiche or parody begins to gradually desert it. 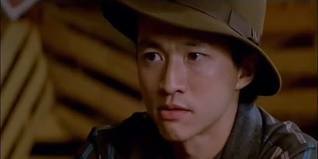 Certain elements remain faintly subversive, such as Dennis Dun's character, whose resourcefulness and intelligence sends up Indy and Short Round in Temple of Doom. But elsewhere the film bears an uncanny resemblance to The Fiendish Plot of Dr. Fu Manchu, Peter Sellers' final film which attempted (unsuccessfully) to send up similar stereotypes. The film forgets about its desire to be ironic as soon as it becomes convenient, settling for spectacle where we expect to see so much more. Even if we attempt to enjoy Big Trouble as empty-headed entertainment, we still don't get very far. One of the pleasures of classic martial arts films was the scale of the fights and the seamless way in which they were filmed. Bruce Lee's fight scenes would be filmed like Gene Kelly's dancing, in long continuous shots which created a natural sense of scale and continuity. A lot of both Lee and Kelly's film work was somewhat lacking narratively, but again it didn't matter because of the inherent physicality and tactility of their fighting and dancing respectively. Big Trouble, on the other hand, has precious little in the way of physicality. The fight sequences may be inventively choreographed, but they are shot from such odd angles and edited so rapidly that you can't tell what's going on or who is fighting whom. Then there are the cheesy special effects, which include beams of light coming out of people's mouths or characters conjuring up lightning like Emperor Palpatine. These effects were created by Boss Films, who did the effects for Ghostbusters, and as with that film the characters become lost in a lot of uninvolving visual trickery. In most cases, the special effects in Big Trouble are there to pad out the action rather than contribute to the story. 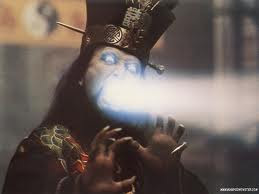 The laser beam fight between Victor Wong and James Hong, in which imaginary warriors are conjured from rings and battle it out, is like watching a boring video game and breaks up the more interesting duel involving Dennis Dun. Even the old-fashioned monsters are no good, with neither the wookie-like creature nor the floating head with many eyes getting anything like the screen time they need to set them up as sustained and believable threats to the characters. On top of all that, the film is populated by a cast of characters which are poorly drawn and unlikeable. Kurt Russell, who has never topped his performance in The Thing, spends most of his time mugging at the camera. While his Clint Eastwood impression in Escape from New York had a certain amount of appeal, his John Wayne impression in this film is off-putting and obnoxious. Kim Cattrall is equally annoying and largely wooden, and the film only seems properly interested in her when she's been dolled up in buckets of rouge. Dennis Dun's character is underdeveloped beyond his one-liners with Jack, and Victor Wong is as criminally underused here as he was in Prince of Darkness. One factor that might mitigate Big Trouble's poor execution is the conditions under which it was made. The film went into production around the same time as the Eddie Murphy vehicle The Golden Child; Carpenter was hired because he could work fast, enabling the studio to get their film out first. Certainly one cannot accuse Carpenter of bottling it in the presence of more money; as his 1990s output shows, he was capable of making bad films regardless of how much they cost. But even with the rushed production schedule, you would have expected someone of his mettle and genre experience to come through with the goods. 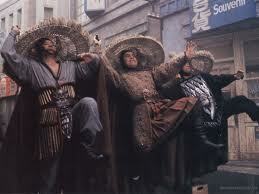 Big Trouble in Little China resembles a dumb mix of Indiana Jones and Year of the Dragon, albeit without the overt racism of the latter. It disappoints as empty action and as an attempted subversion of martial arts clichés. It still has pockets of humour, whether intentional or otherwise, which keep it from being either depressing or Carpenter's worst film. But it simply doesn't cut the mustard either as a Carpenter film or on its own terms - it's no fun, and nothing but trouble. Great review man! I agree with pretty much everything you said, I was very disappointed with this one.